Croquembouche - Saving the world from bad baking. A Croquembouche is a French Wedding Cake and it is assembled from lots and lots of profiteroles, filled with vanilla or chocolate Creme Patissiere, put together with golden toffee and partly dipped in pearl sugar. 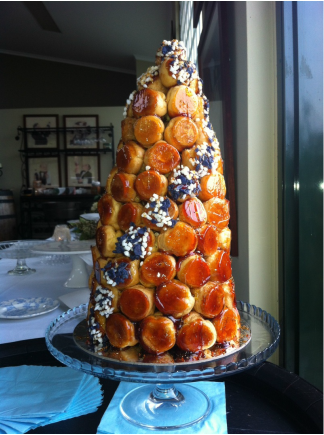 Price depending on size of the Croquembouche / number of Profiteroles used, e.g. two - three per wedding guest. The different kind of team building for teams of 2-5 people. Everyone gets to make profiteroles and then it's the team, assembling the Croquembouche and sharing the delicious piece of art amongst themselves or with other colleagues in the company. Starts from $300 for a team of four.